A Poem for Lonesome George is a multi-media video installation designed specifically for the Marquee that exists as a poetic memorial to Lonesome George, the last of the Pinta Island tortoise species, who passed away in captivity at a research station in the Galapagos on June 24th, 2012. For over forty years George lived as the last of his kind on earth and he became an icon for conservation efforts across the globe. With his passing there is the finality of extinction. The memorial centers upon the symbolism of the Japanese cherry blossom, beautiful and fleeting, as a representation of the ephemeral. In this context the blossoms function as a reminder of the transience of existence, the fragility of the earth’s balance, and the failure of our responsibility to nature. VIDEO LINK: Watch a 3-D video simulation of A Poem for Lonesome George. “Art on the Marquee” Round 16: Exhibition and Reception Information. Boston Cyberarts and the Massachusetts Convention Center Authority have teamed up to create “Art on the Marquee,” an ongoing project to commission public media art for display on the new 80-foot-tall multi-screen LED marquee outside the Boston Convention & Exhibition Center in South Boston. 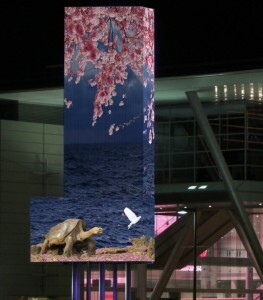 The largest urban screen in New England, this unique digital canvas is one of the first of its kind in the U.S. to integrate art alongside commercial and informational content as part of the MCCA’s longstanding neighborhood art program. “Art on the Marquee” offers artists more than 3,000 square feet of digital display on seven screens, providing full-motion video and a viewership of more than 100,000 pedestrians and motorists. 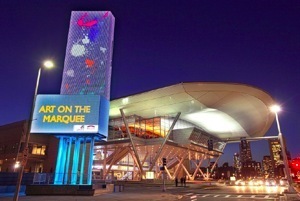 The marquee is visible for a half a mile in many directions and is seen by traffic on Summer, D, and Congress streets, as well as from the surrounding hotels, office buildings and the Seaport World Trade Center.